We were lucky enough to have had our wedding ceremony and reception here. Everybody always thinks their wedding is perfect but genuinely this couldn’t have been better. The staff as always were helpful and friendly and made everyone feel at home. They were almost invisible except when they were needed when they seemed to automatically know and then magically appear. This helped to add to the feeling of an intimate and very personal celebration. Lauren who organises the weddings is super efficient which was much appreciated by a very disorganised bride and groom! And she is always so patient and so smiley. Everybody commented that the food was amazing. We had the BBQ banquet with steak, chicken, sausages, sardines, haloumi and lovely bread and salads. The kids couldn’t get enough of the chicken and all the guests went back for more. My parents were worried that there might not be enough food as our family does like to eat a lot but the food just kept coming and everyone was stuffed. Not too full though they didn’t also polish off the lovely deserts and then later on the Cornish cheeseboard served with oatcakes and chutneys. The venue let us bring our own alcohol and just charged a very reasonable corkage. This meant that we could serve Pimms on the terrace and then have bottles of various ciders and apple juice on the tables that we bought from Healey’s cyder farm not far from Porthtowan which all added to the summery and Cornish atmosphere. As a backdrop for any special occasion you couldn’t get much better than here. The big glass doors open up onto your private terrace (and then you are onto the beach) so that everyone can enjoy the magnificent views. We were lucky enough to have a beautiful sunset on our special day. Parents were able to watch their kids playing on the beach while they relaxed on the terrace so that children and grown ups were granted the opportunity to enjoy the celebrations how they wanted to. As it got later and inevitably chillier, we were able to provide blankets to enable guests to stay out and enjoy the terrace all evening. The overall atmosphere was relaxed, chilled out and no hints of the pretentious formalities that are often forced upon people at other wedding venues. This filtered through to the guests and meant that everyone could just let their hair down and be themselves. This was the most important thing for us and we were so lucky to have found this place. 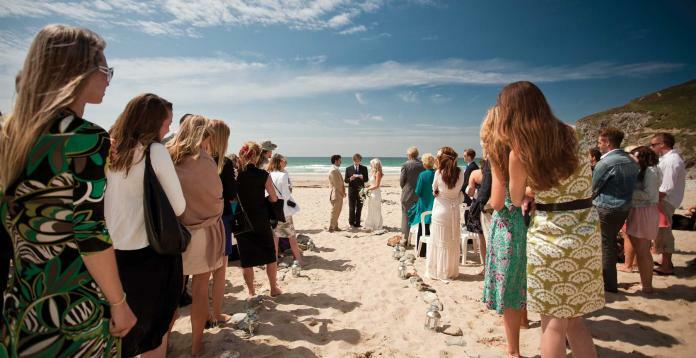 Don’t be fooled by other venues that charge crazy prices for a wedding near the beach. This place is excellent value and provides a much better experience. We can’t recommend it highly enough. Here are some local wedding services to help plan your special day. 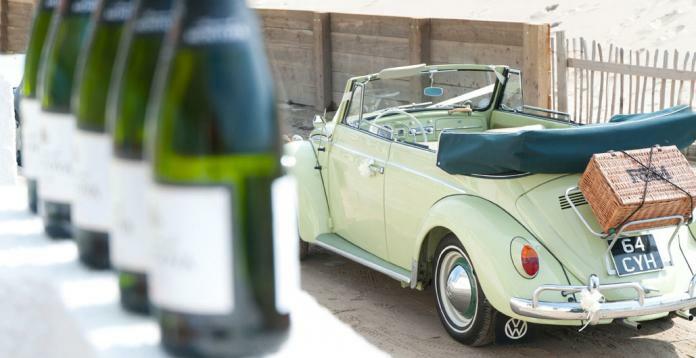 VW camper vans to suit the perfect beachside wedding.